The Friday night after Thanksgiving is when all the little forests pop up around the city. Most Christmas tree outlets—bodegas, parks, supermarkets, and big-box stores—have a team that comes in to set up wooden display racks, while electricians wire up lights to a generator and a truck drops off Fraser Firs to sell the next day. Sometimes the sellers come from all over the world—but they may also just be from Queens. In both cases, they've most likely been doing it for years. After I took a few photos of Soho Trees, on 6th Avenue and Spring Street, I walked over to the rental RV from which the trees were being sold. I asked the man inside if he would mind talking to me, and—wearing sunglasses and a hat—he fervently responded, "Why? You want some work?" His name, he said, was Willie "The Hat." I had to decline, but Willie explained how, over his 20 years of experience selling Christmas trees, word of mouth had begun to spread to travelers who were looking for a ground-level experience of New York City. If they find Willie, he can offer them work selling trees in exchange for a steady way to live in the city for a few weeks. Willie has had workers from all over the planet. It's uncommon to find a bodega in New York not selling Christmas trees after Thanksgiving. H&H Kim Corp on Thompson and Prince has been selling them for 20 years, since the bodega first opened. 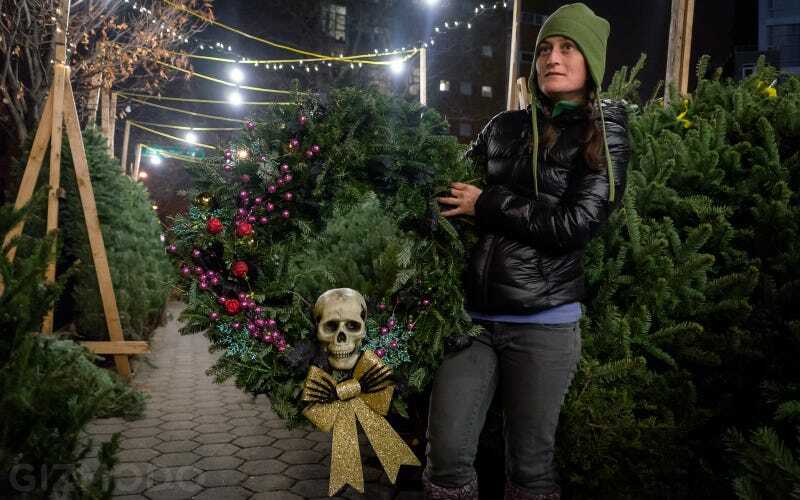 Soho Garden, a few blocks west on Prince and Mulberry, is considering ending the tree sales after this year, even though they, too, have been selling them for a long time. The antithesis of bodegas and parks is the local Whole Foods, such as the one on East Houston and Bowery. When I stopped by their Christmas tree stall, I spoke to Gabriel, who normally worked inside at the healthcare section. He had been stationed outside selling trees at the time. He told me Whole Foods used to hire a man every year to be the dedicated tree salesperson—but he never showered, so they had to fire him and they then made it an inside job. In Brooklyn, selling trees is a different game altogether. With more room to breathe, big chain stores, like Lowe's and Home Depot, sell entire lots full of trees come the holiday. This makes it especially hard for independent sellers. At Botanica, on Atlantic Avenue in Boerum Hill, Marty Lake has been selling trees at the newest location of his 18-year span in the business. Marty explained to me that the sheer buying power of big companies makes it difficult to keep up. In the back of Botanica, Marty keeps a selection of healthy trees in a beautiful garden space that no Lowe's or Home Depot could replicate. Nearby, only a short walk from the Gowanus, under the steel girders of the F train, on an unmarked street that shares a parking lot with a Lowe's, is a different kind of tree seller. This is Vin Divino's Christmas tree stand. Even with the stand's close proximity to Lowe's, Divino has easily outsold the big company every year. While Lowe's tends to run out of trees, Divino always manages to keep some in stock. His brother, who was watching the stand at the time, said that the Lowe's hates them for stealing all their business. Further north, outside the C Town on DeKalb, in Clinton Hill, three trees and five wreaths laid out on the sidewalk make for what is perhaps the most modest Christmas tree stand in New York. I asked the man minding the stand if I could talk to him about his business. He said, "I don't wanna be on the internet, man. I'm hot." I left the conversation at that. Gregory Walsh sells the most beautiful trees in the city. The deep-green, handpicked selection on the Driggs and Manhattan corner of McCarren Park that he brings back from Oregon every year are the best I saw at any stand. Walsh has been selling trees for 30 years. He does this during the holiday season in addition to his year-round, full-time job teaching special education in Queens. He runs six spots in the city and has been running the McCarren Park location for the past seven years. All his employees say they're lucky to work for him. Walsh's employees, when not selling trees, spend time reusing trashed car and bicycle parts to make ornaments or unique decorative wreaths like the one pictured as top art. Not every vendor can sell the way Walsh does. Each stand in the city makes do with whatever space is available, whether its under the F train or in the shadow of the projects. As diverse as the locations are, each Christmas tree vendor is even more unique. It's a New York subculture that paints a diverse and ambitious picture of the New York the city struggles to be.